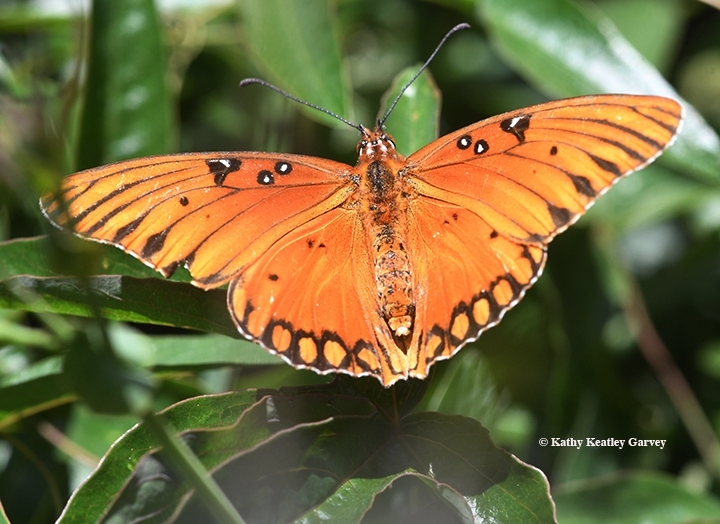 No wall can separate a Gulf Fritillary from its host plant, the passionflower vine (Passiflora). The Gulf Frit Agraulis vanillae), an orangish-reddish butterfly of the family Nymphalidae, fluttered over our six-foot fence, heading straight for the passionflower vine. What's a little height when there are eggs to lay? The showy butterfly's silver-spangled underwings glowed in the sunlight. Its history glows, too. It first appeared in the vicinity of San Diego in the 1870s, according to noted butterfly researcher Art Shapiro, professor of evolution and ecology at the University of California, Davis. 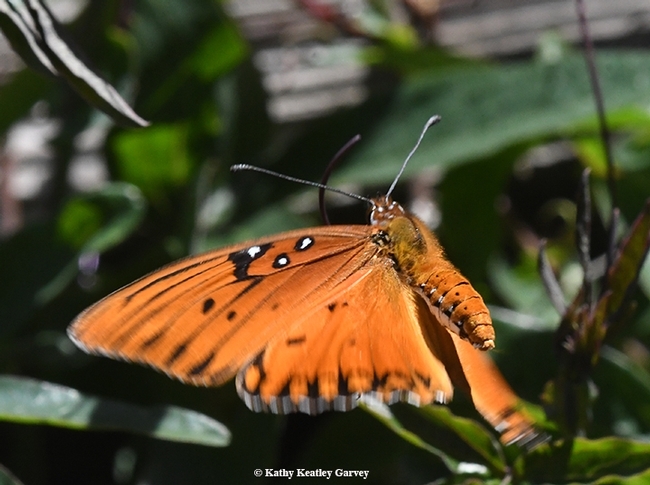 He's been monitoring the butterflies of central California for four decades and maintains this website. Last year, at our home in Vacaville, the caterpillars were so thick on the vine that they skeletonized it. Killed it, they did. Deader than the proverbial doornail or a nail hammered into the fence. But not to worry--we have more plants this year for them. 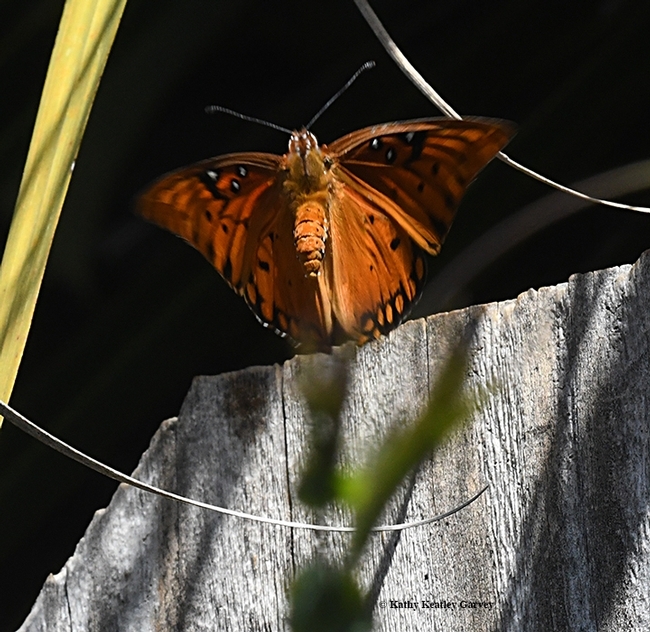 Watching them flutter over the wall and lay their eggs on the Passiflora is a good thing. 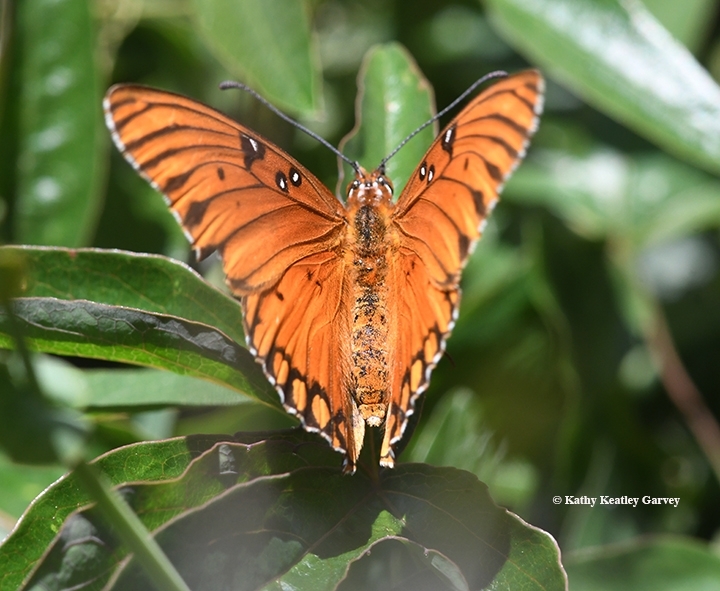 Soon we'll see males chasing them like winged ballet dancers, eventually providing us with even more Gulf Frits. You can never have too much of a good thing. Not ever. 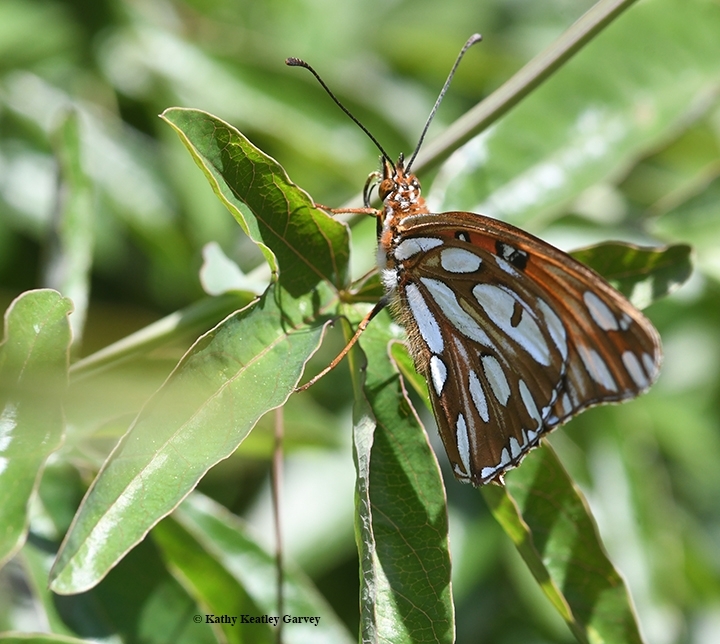 Lots of fritillaries here in the Dallas, Texas area too! And like you said... the caterpillars nearly stripped my passionflower vine! But, they were gladly forgiven and perhaps I just need to plant more vines! Love to see the butterflies flitting about in the garden and love it when the sun hits that silvery underside of their wings! And... "click" goes the camera! There are fritillary caterpillars on my passion vine in Sonoma.Will they overwinter as chryssalises or continue on to complete their life cycle as a butterfly? I am worried about the cold weather snd if it will affect them as butterflies. Thank you for your comment. Art Shapiro, UC Davis distinguished professor of evolution and ecology, responds: "The Gulf Frit is a subtropical and tropical bug and has no adaptations to survive cold winters. It will attempt to breed all winter and any stage can survive so long as temperatures stay above about 21-22F, which is lethal to them all. One can protect garden colonies just as one would protect a sensitive plant, by putting a cover over them!"